Bright stars of the night… a strange idea was planted in my imagination a long time ago (in my childhood, I guess) that when a star is falling across the sky, it is a sign that someone is dying in a faraway place. It was a sad image and after some thought I decided to believe in a contrary concept—that when a person dies, their spirit goes up into the sky and… a star is born. So that’s why there are so many stars in the sky! With a great sorrow I learned last Sunday that Václav Havel had died. My thoughts traveled immediately to beautiful Prague, to the starry sky above that city he loved. 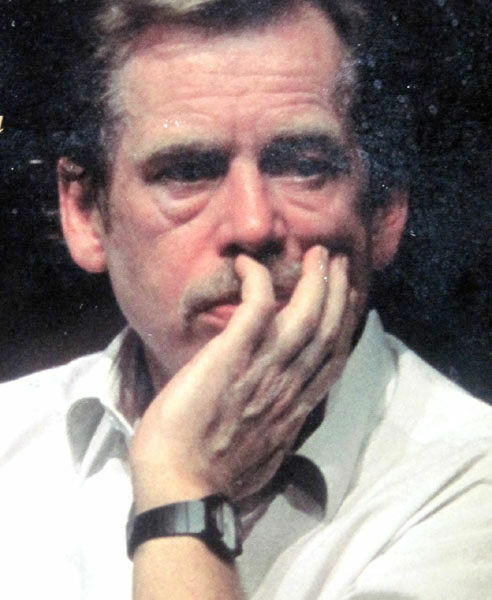 Although he died in his country house away from Prague, it is Prague that contains memories of Havel as a playwright, an intellectual, and as a leading dissident against the Communist system which consequently forced him to five years “residency” in prison. Years later, after the Berlin wall fell—as the result of a hard won peaceful revolution by Eastern Europeans—Prague gained memories of Havel’s 14 years “residency” in a very different place, a presidential palace. He first became President of Czechoslovakia and later President of the Czech Republic. 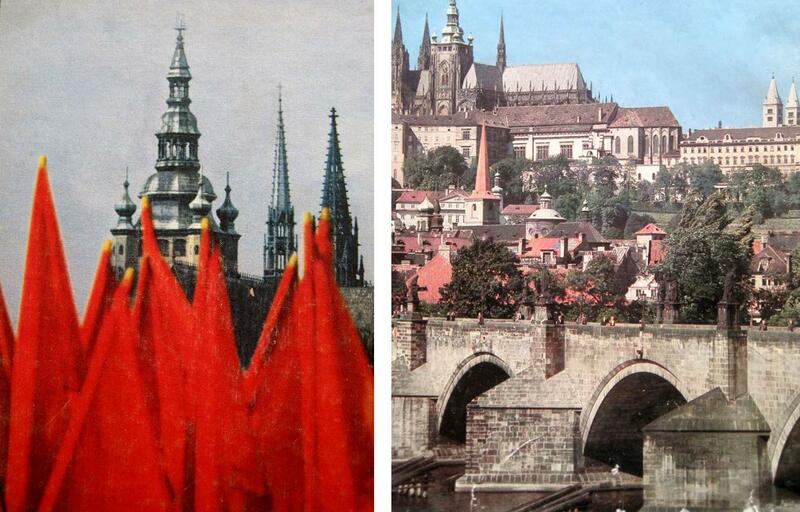 Prague wrapped in the red power of Communism & Prague, a durable beauty of yesterday and tomorrow. I am writing this today because I have been greatly influenced by Václav Havel’s writings — not so much as the playwright, but as the political activist and thinker. Coming from the same corner of the world, dealing with the same political and social issues, I have a special respect and adoration for the political activists and writers like Havel and Adam Michnik (of Poland) — for their vision, their passion and their intellectual leadership. The only comfort one might have after Havel’s death is that his spirit is captured in his writings. So I spent an entire night re-reading pages and pages of Havel’s words. 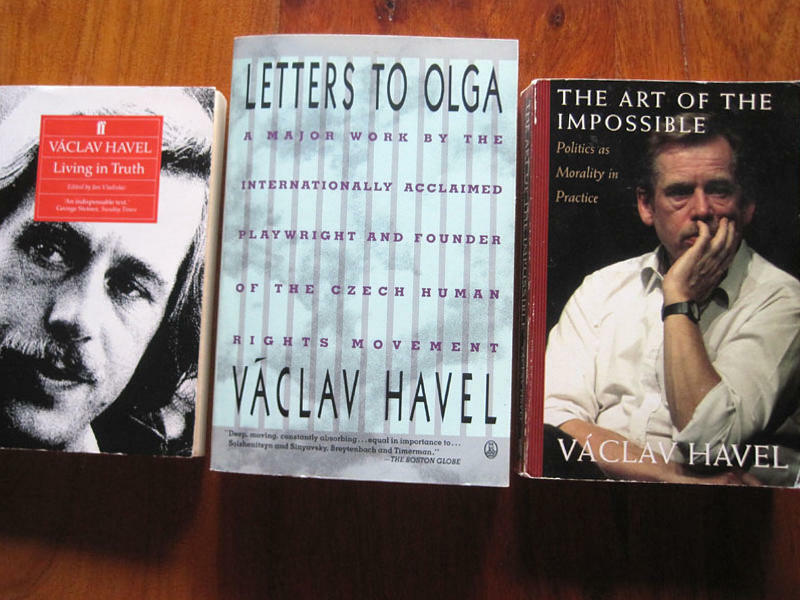 Although I like Letters to Olga very much — it is a collection of Havel’s letters from prison to his first wife Olga Splichalova — I opted for some quotes from The Art of the Impossible, which is my favorite book by Havel. In this collection of speeches from the time of his presidency, Havel shares his views on today’s social and political issues. Here I have the privilege to quote the words that resonate with me the most. Communism was not defeated by military force, but by life, by the human spirit….It was defeated by a revolt of color, authenticity, history in all its variety, and human individuality against imprisonment within a uniform ideology. The totalitarian system of the communist type, as established in the former Soviet Union and subsequently imposed on all countries in the Soviet sphere of influence, not only destroyed political pluralism and the prospects of real political opposition, but annihilated politics itself as a field of practical human activity. Despite the political distress I face every day, I am still deeply convinced that politics is not an essentially disreputable business; and to the extent that it is, it is only disreputable people who make it so….But it is simply that a politician must lie or intrigue. That is an utter nonsense, put about by people who—for whatever reasons—want to discourage others from taking an interest in public affairs. When I look around the world today I feel strongly that contemporary politics needs a new impulse, one that would add a badly needed spiritual dimension. Perhaps this impulse will come from some place other than the postcommunist countries. Yet it seems to me that come it must. The modern era has reached a point of culmination, and if we are not to perish of our modernness we have to rehabilitate the human dimension of citizenship as well as of politics. This is what I consider to be the principal challenge of our time, a challenge for the third millennium. Democracy is an open system, and thus is capable of improvement. Among other things, freedom provides room for responsibility. If that room is not sufficiently used, the fault does not lie with democracy, but it does present democracy with a challenge. Dictatorship offers no room for responsibility, and thus it can generate no genuine authority. It is obvious that those who have the greatest power and influence also bear the greatest responsibility. Like it or not, the United States of America now bears the greatest responsibility for the direction our world will take. The United States, therefore, should reflect most deeply on this responsibility. With a little exaggeration we might say that death, or the awareness of death—this most extraordinary dimension of man’s stay on this earth, inspiring dread, fear, and awe—is at the same time a key to the fulfillment of human life in the best sense of the word….Death gives us a chance to overcome it—not by refusing to recognize its existence, but through our ability to look beyond it, or to defy it by purposeful action. Knowing that Havel liked jazz, I chose Jan Garbarek’s composition titled We are the Stars to honor him. I am pretty sure that he would like it and I hope you will like it too. Click on the title above to hear the music and here are the words. For we are the stars. For we sing. for its journey through death. Please don’t forget the special offer at the end of my previous post. Text copyright © 2011 by Alicja Mann. Photos of the book covers: first- Prague Time Life Books © 1980, second- Prazsky Hrad by Karel Plicka © 1962.